Life's Journey To Perfection: Family Home Evening: My Gospel Standards: I will do those things on the Sabbath that will help me feel close to Heavenly Father and Jesus Christ. As you may have noticed I have changed from doing Mommy Mondays and have been posting my Family Home Evening ideas instead. It is too hard to get to posts in on Mondays. Especially with school being in and trying to help with homework and such. Family Home Evening Outline for: I will do those things on the Sabbath that will help me feel close to Heavenly Father and Jesus Christ. 11 For in asix days the Lord made heaven and earth, the sea, and all that in them is, and rested the seventh day: wherefore the Lord bblessed the sabbath day, and challowed it." Discuss what decision this boy made to keep the Sabbath Day Holy. 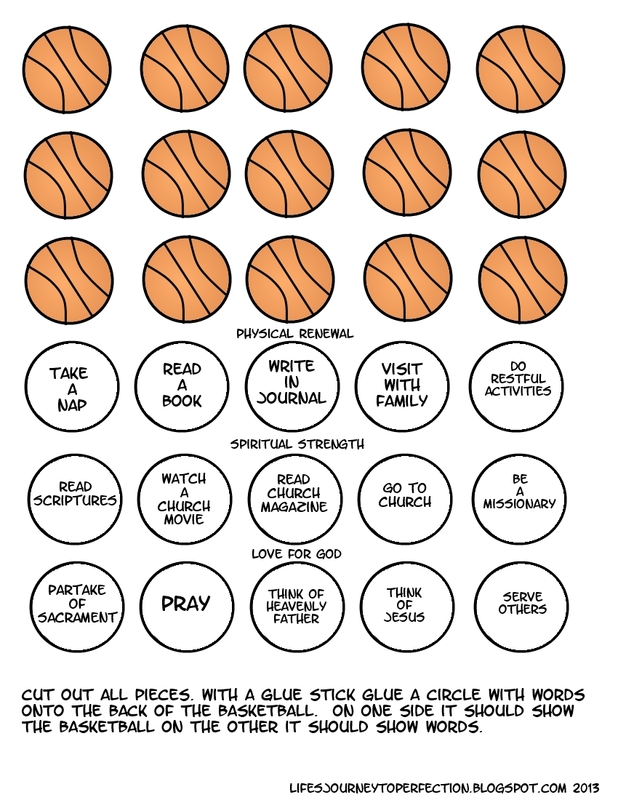 Show the Basketball Hoops (Basketball Hoop printable). 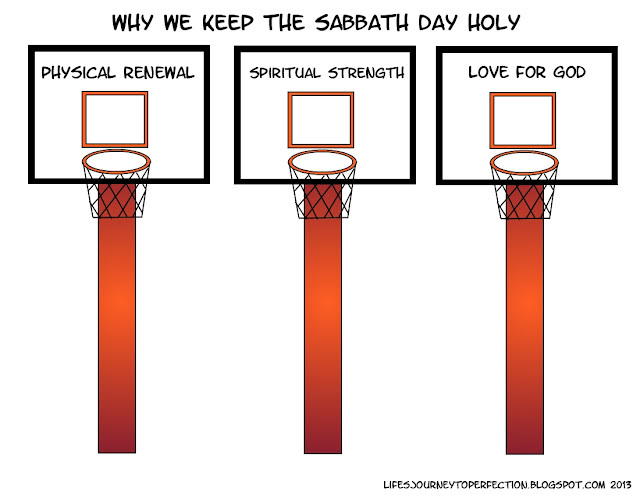 Discuss the three reasons why we keep the Sabbath Day holy. Physical Renewal: Ask how many days there are in a week (A. seven) Read this Scripture again Exodus 20:11. Talk about how we are working by going to school, working, doing chores and playing six days of the week. Just like Heavenly Father and Jesus created the world in six days and then rested on the seventh day, we also need the seventh day to rest physically. Spiritual Strength: By keeping the Sabbath day holy we will strengthen ourselves spiritually. We need that spiritual renewal to make it through all of our activities throughout the week. Love for God: Our Heavenly Father has done so much for us. We need to give him that one day to show complete devotion and love for him. Have the basketballs laying out randomly. 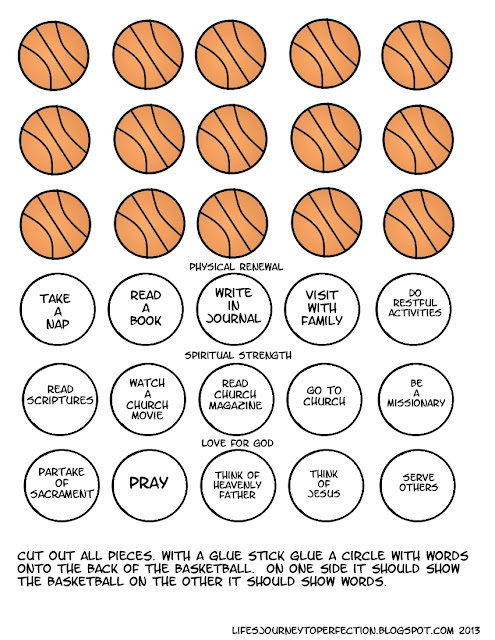 Have a family member pick a basketball and read what is on the back. Have them decide what hoop it should go under. Discuss how that activity is keeping the Sabbath day holy. Continue giving each family member turns until all basketballs are under a hoop. Next discuss the activities we should avoid doing on Sunday. Explain that we have 6 other days through out the week to do these things. “Overworking and staying up late Saturday so that you are exhausted the next day. “Filling the Sabbath so full of extra meetings that there is no time for prayer, meditation, family fellowship, and counseling. “Doing gardening and odd jobs around the house. “Playing vigorously and going to movies. “Reading material that does not contribute to your spiritual uplift. “Shopping or supporting with your patronage businesses that operate on Sunday, such as grocery stores, supermarkets, restaurants, and service stations” (“Keeping the Sabbath Day Holy,” Ensign, May 1971, 6–7). Take two graham cracker halves, place on a plate. On one half put a large marshmallow or several small ones. On the other half place a square of chocolate or several chocolate chips. Place in microwave and cook for approx 15 sec. Just watch for the marshmallows to start to puff up. Take out of microwave put the two halves together and enjoy! !